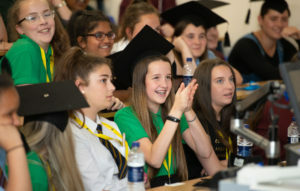 First Campus hosted the Year 9 Residential from the 4th – 6th of July 2018 at Cardiff Metropolitan University. 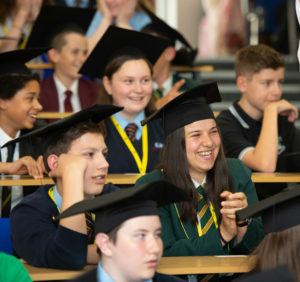 The annual event sees pupils from schools across South East Wales visit the University for a taste of student life and aims to raise their future educational aspirations. 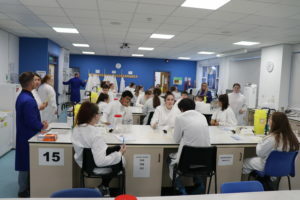 ‘My favourite part was when we had a special cream and shook hands to see how bacteria is passed on’. 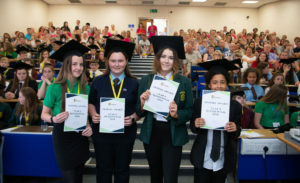 We were delighted to welcome the participant’s families, teachers and head teachers to Cardiff Met for the ‘Graduation’, celebrating the achievements of the young people and wishing them all the best in their future endeavours. The long-term impact of the Residential project was highlighted this year by the educational journey of Matthew Collins, one of the Student Ambassadors working on the project. Matthew attended the Residential when he was a Year 9 pupil at Barry Comprehensive School. He went on the study an undergraduate degree in Cardiff Metropolitan University’s Cardiff School of Sport and graduated in July 2018 year with a PGCE in Secondary Physical Education from Cardiff School of Education and Social Policy. Matthew has now secured a teaching position at Fitzalan High. We wish him every success and know he will inspire many other pupils with their educational journey.